Cakes are all time kids favourite and when it is made with fresh strawberries it is mind blowing and tempting. 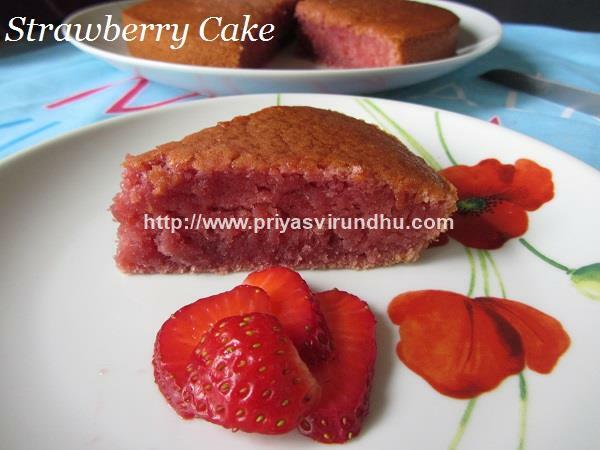 This strawberry cake is egg less and butterless, so you can eat as many slices as you want without any guilt. Try out this pink beauty and post your comments. Do not forget to check out other creamy, fluffy andheavenly cakes here. 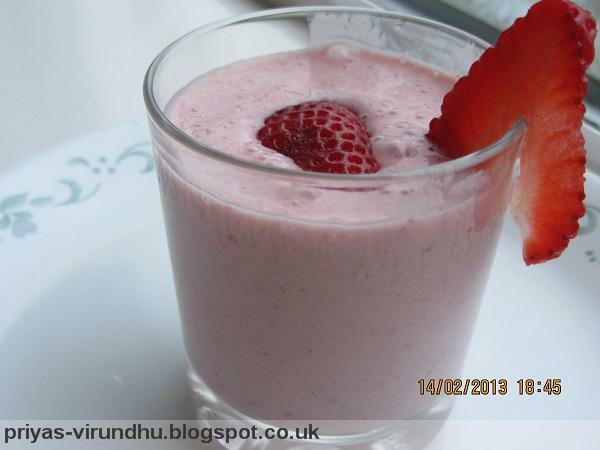 Who can say no to this gorgeous, luscious and delicious strawberry lassi ? 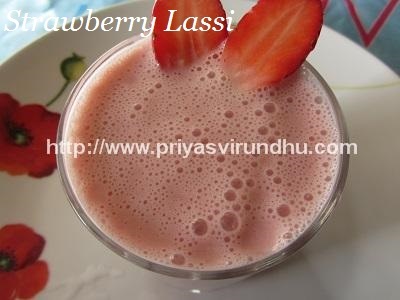 Try out this colourful and cooling strawberry lassi for this hot summer and enjoy. 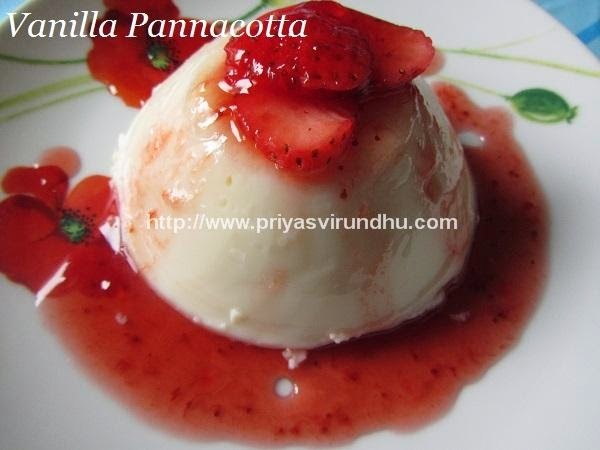 Here’s how to make Vanilla Panna cotta with photos…. 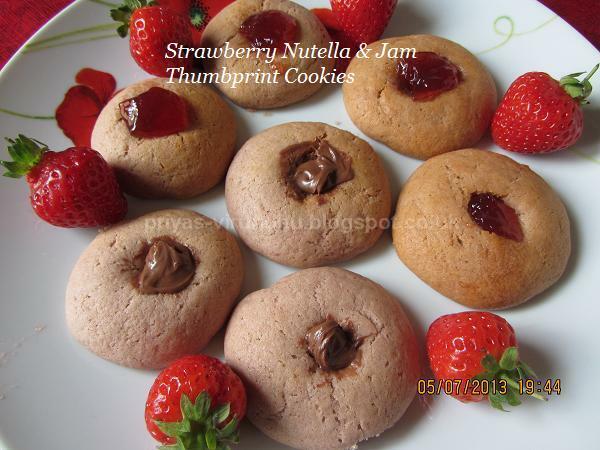 I baked Strawberry Nutella Thumbprint Cookies and Peanut Butter Cookies[PBC's] for the third Home Baker’s Challenge(HBC) initiated by Mrs. Priya Suresh of Priya's Versatile and hosted by Mrs. Viji of Virundhu Unna Vaanga. The main objective of Home Baker’s Challenge is to learn and bake together. Thank you very much Mrs. Priya Suresh and Mrs. Viji for this wonderful and delightful challenge. This month’s challenge was to bake cookies announced by Mrs. Viji. She gave four different types of cookies and I chose to make two different types of cookies for the challenge and here are the Strawberry Nutella Thumbprint Cookies for HBC. My Valentine's day menu continues in this post. In my previous post, I had the recipe for Middle Eastern Falafel, with pita bread and salad. For dessert I made the strawberry and banana smoothie. So I thought I will share it with you.